We have 90 decks coming your way. Are you ready? Listen to all that went into making commander. “Nah, it’ll be a piece of cake,” I said breezily. As it turned out, the stapler-thrower was right, and I was wrong. Commander (2016 Edition) proved to be the most challenging design of my five-and-a-half-year career at Wizards of the Coast. That’s pretty dramatic. So what happened? We assembled a team of intelligent, attractive, and charming designers who all happened to be avid Commander players. For all of the details about these amazing folks, I recommend checking outMark Rosewater’s article today. In our first couple of meetings, I reassured everyone that I wasn’t actually bound and determined to do four-color Commander decks and that we should discuss it as a group and explore all of the options. We talked about all of the different options and angles we could think of. Still, I felt it in my bones that 2016 was the right year to do four-color decks, and presented a compelling case. 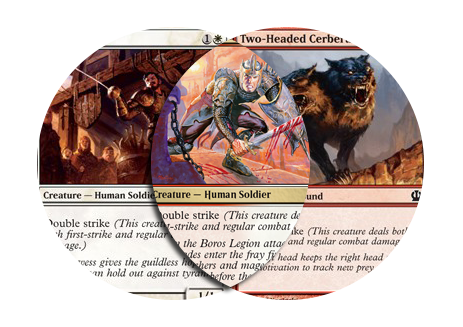 I talked about where the Commander product line had been (we’d done three-color wedge decks, three-color shard decks, monocolor decks, and enemy color decks) and where I imagined it would go (we’re going to REDACTED, REDACTED, and perhaps even REDACTED). I talked about how four-color legendary creatures were one of the things most frequently requested by our fans, and that aCommander product was the best venue to print such cards. We decided that four-color decks were the way to go. I had been working on a list of potential four-color deck themes for years, so I felt like we had a good head start on building some decks. These themes were very mechanically inspired, and based on what sorts of things we’d done in Magic‘s past. For example, there were a lot of Zombies in Grixis and in Golgari. We could have blue-black-red-green (UBRG) be a Zombie tribal deck! Or, exalted was in Bant in Alara block and in white-black in Magic 2013. We could make a green-white-blue-black (GWUB) exalted deck! This seemed like a fine way to go, so we built decks along these lines, and started working on making commanders for them. I knew we wanted to make some “Nephilim-style” commanders, which were regular multicolor cards. 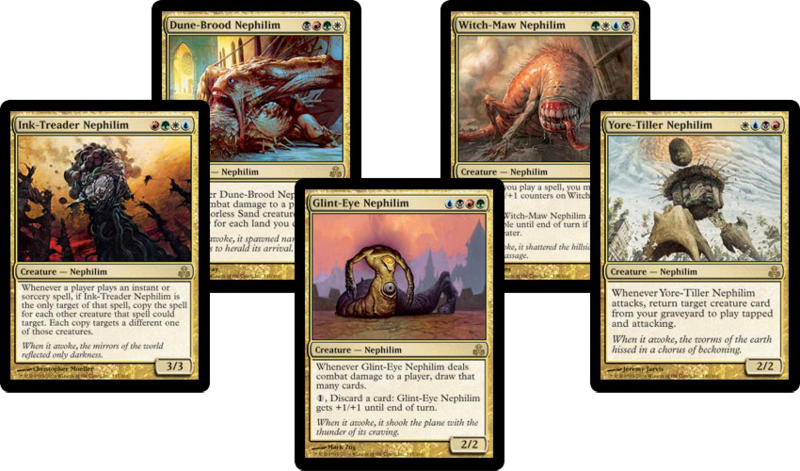 These were named after the only four-color cards in Magicthus far, the Nephilim from Guildpact. These were the most straightforward executions of four-color commanders. One of the quirks of the Commander rules is that if a mana symbol appears in the casting cost or in the text box of a card, the color of that mana symbol contributes to the card’s “color identity.” So if you used Ishkanah, Grafwidow as your commander, you could include green or black cards in your deck. Or if you used Alesha, Who Smiles at Death as your commander, you could include red, white, or black cards in your deck. And even though Memnarch is a colorless artifact creature, his color identity is blue because of his blue activated abilities. We designed a bunch of “wild card” commanders along these lines. Hybrid mana legendary creatures with completely different hybrid mana activated abilities. Monocolored legendary creatures with three differently colored activation costs. Legendary artifact creatures with four-color activated abilities. And so on. I won’t keep you in suspense on these: none of them worked out. The cards that were easiest to design were the hardest to concept, and vice versa. It’s very important that Magic cards have a satisfying unity of mechanics and creative treatment, so we decided not to proceed with the “wild card” commanders. I thought you said this was really challenging. When devign (the period of overlap between design and development) began, lead developer Ben Hayes had an idea. The commander we designed to support one of our mechanical themes (Simic plus Abzan equals GWUB +1/+1 counters) spoke to Ben on a more fundamental level than the other commanders did. What if the GWUB had a factional identity, like Orzhov has an identity that is a subset of white-black, and in some ways is more than the sum of its two parts? These cards take an effect that would be appropriate for Color A and one that would be appropriate for Color B and crudely glue them together onto one card. 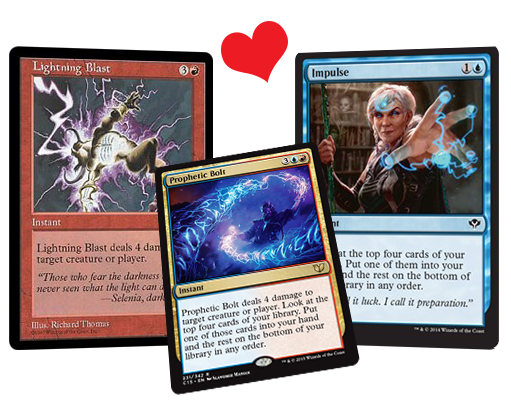 An example is Prophetic Bolt, which combines the effects of the red card Lightning Blast with those of the blue card Impulse. These are cards that we could print as either color. These days, we try to reserve these types of designs for hybrid mana cards. An example is Boros Swiftblade; white creatures and red creatures can both have double strike. These cards specifically call out their colors (or associated basic land types) in their text box. An example is Tolsimir Wolfblood, which gives your other white creatures +1/+1 and your other green creatures +1/+1. These cards have effects that are without precedent in Magic‘s history. An example is Phytohydra. These cards are members of factions that themselves have multicolor abilities. This allows us to make monocolor or multicolor cards with the same multicolor-themed ability. A good example is cards with the scavenger ability. These can be black cards, green cards, or green-black cards. The Golgari factional identity can apply to any of these three color profiles. The concept of drawing strength from the dead is part of Golgari’s theme. Importantly, it’s not the only way that green and black can work together, but it’s Golgari’s way of doing things. 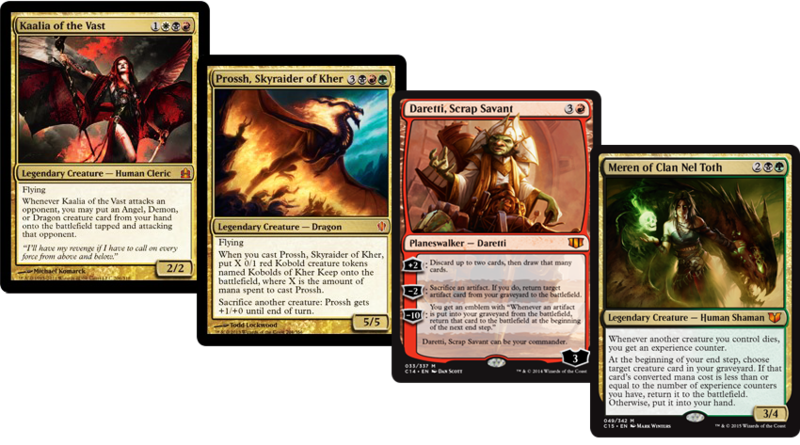 What Ben was suggesting was that we apply a “Ravnica guild”–style identity to each four-color group. He believed that we had already backed into this with our GWUB +1/+1 counters–themed deck. Red, the missing color, was all about instant gratification and throwing away resources. The GWUB deck was all about building up slowly over time. It was antithetical to an aspect of red’s philosophy in a way that was fun to play in Commander. He challenged the design team to come up with a similar “Guild identity” for each four-color grouping. White embraces the progress exemplified in civilization. Blue finds technology fascinating. Black sees no moral distinction between the natural and the artificial. Red is happy to create and to destroy. But green? Green hates all of these things! This deck utilizes a variety of “artifacts matter” cards from all four of its colors, along with a selection of colored and colorless artifacts. This is for players who want to build an intricate machine and use it to gain advantage over time. Blue is eager to discover the results of empirical experiments. Black is happy to confuse its enemies. Red embraces chaos on an elemental level as an essential part of its nature. Green is content to let the universe unfold as it will. White, as the color of order and structure, tries to contain chaos at every turn—but chaos will not be contained! This deck embraces variance, playing cards sight-unseen from the top of the deck, flipping coins, and otherwise injecting additional randomness into the game. This deck is for players who prefer to “just see what happens” than to carefully plan each move. Black believes in strangling the young before they grow up to become a threat. Red loves to fight for the sheer exhilaration of it. Green understands that survival of the fittest makes the whole of nature strong, and white is willing to fight to defend its people and its beliefs. Blue, however, would prefer to slow down and study the situation in order to find the correct solution. The aggro deck is unconcerned with politics; it simply wants to kill everyone at the table as quickly as possible. This deck is ideal for players who hate to durdle and prefer a play style more akin to Limited than the usual Commander fare. Red loves its friends. Green understands the power of symbiosis. White believes in community above all else. Blue values knowledge, and believes that it should be shared freely. Black sees selfishness as a virtue and believes that altruism only encourages weakness. The pilot of this deck wants everyone at the table to have a good time and is eager to see what everyone’s deck can do. That’s why it’s going to help everyone out with mana, cards, and some tokens here and there. Of course, some people are suspicious of gifts, so this deck must contain a few things to make attacking its pilot difficult. Green appreciates that a mighty oak grows from a tiny seed. White is the great builder of civilizations. Blue wants to expand its understanding. Black wants to increase its power. Red, acting on impulse, cares not about the future and only wants what it can have now, now, now! This deck features a heavy counters (especially +1/+1 counters) theme. Any of its creatures has the potential to grow into a huge threat, given enough time. This deck is for every player who is thrilled at the idea of a 64/64 Hydra. That’s interesting, but what about a preview card? Good idea, conversational voice in my head! “At the beginning of your end step, proliferate.” It hard to imagine a line of text that embodies “long-term growth” better than that! And with access to four colors of cards for your deck, there are all sorts of disgustingly powerful counters you could proliferate with Atraxa. Using the above categories, Atraxa is half “Chinese Menu” and half “Shared Hobby.” She has four keywords, one for each color, and her proliferate ability represents her membership in the GWUB “Growth” faction. Creatively, Atraxa is an Angel created by four of the Praetors of New Phyrexia. Urabrask, the red praetor, doesn’t cooperate with the others, so he wasn’t involved in the process. Atraxa was created to be the perfect envoy. What about another preview card? C’mon, man. You’re getting kinda greedy, don’t you think? Anything! Doesn’t even have to be a mythic rare! As you can imagine, mana bases were a bit tricky for this product. I wanted to make us some new tools to use to help people cast all four of their colors of cards, so we made six new cards with basic landcycling. For most of these, I wanted to attach the ability to relatively expensive cards that have narrow uses, but really come in handy sometimes in Commander games. 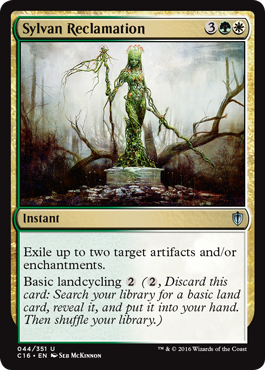 Exiling artifacts and enchantments is an example of something that can be absolutely critical in some games and completely worthless in others, so it made a perfect candidate for a basic landcycling card. The original basic landcycling cards from Conflux cost colored mana to cycle, but I wanted generic mana costs here. No sense in making you fix your mana before you can fix your mana, right? As an aside, take a look at that art! Ever since Shadows over Innistrad came out, I’ve been a huge Seb McKinnon fan. When the full decklists become available, you may notice that we did some unusual things with the mana bases. We normally don’t put rare dual lands in Commander preconstructed decks. We prefer to put those types of cards into products intended for a wider audience, such as our main booster releases or Masters products. We knew that four-color decks presented a special challenge for getting access to all of your colors of mana, so we spent some time identifying rare dual lands that we didn’t think we’d want to put into booster packs in the near future. 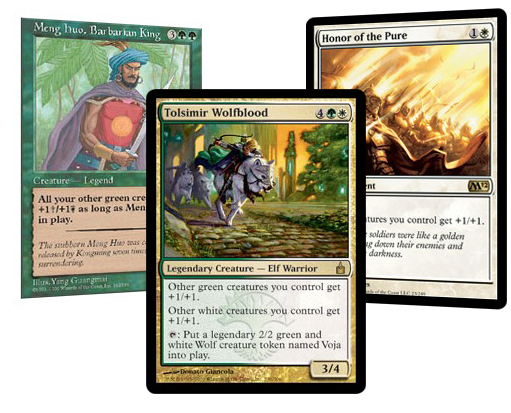 We put a few of those cards into the Commander 2016 decks to help the decks run smoothly. ALL RIGHT. BRING IT ON HOME. I’m really proud of the job we did on Commander (2016 Edition). The design team buckled down and came up with some great themes, and the development team made those themes really work. The decks feel more like homemade Commander decks than any of our previous offerings, in my opinion. They’re downright weird! I hope you’ll have fun with them, and I hope you’ll build a new deck with a new commander (or commanders!) and find some sweet new cards to add to your existing decks. You can find the follow article this was taken from here.